World Flower - Ghost House is the Ghost House of World Flower in New Super Mario Bros. 2. This Ghost House features the second appearance of the Boohemoth. The Boohemoth in this Ghost House appears when Mario or Luigi fall into the water-filled level. Mario begins on the floor of the ghost house in front of a Boo and under a spider web. Going up are two sets of ? Blocks and Brick Blocks on each side of the wall. One of them is a multi-coin Brick Block and another contains a Super Leaf. Mario then has to climb up more spider webs to the next level, where even more spider webs, a Boo and a Gold Ring awaits. Obtaining the Gold Ring causes the Boo to turn golden, move away from Mario and leave behind a trial of coins. The path up then splits into two. Up the left path are several sets of stairs with several Goombas on them. At the next level is a Big Boo, more spider webs and another Gold Ring. Climbing up the spider webs leads to the top level where a lone ? Block sits above the second Star Coin. The ? Block contains a Star which, upon collecting, turns all floors, stairs and spider webs into coins and the room changes significantly, such as the lowest level now being filled with water. Mario then has to move to the right (at the bottom of the Ghost House) into a small path. Boohemoth subsequently appears. Mario has to navigate through the path which is halfway filled with water. Strong water currents can be found here along with several Peepas. A door leading outside can then be found. A Boo and several more spider webs can be found, followed by the flagpole. Star Coin 1: At the fork, the player should take the right path and navigate through the spider webs to find the Star Coin. Star Coin 2: This Star Coin can be found enclosed in walls below a ? Block containing a Star. Mario needs to collect the Star within the area above the Star Coin so that Mario drops down to the Star Coin when everthing changes to coins. Star Coin 3: Before the door leading to the flagpole, the Star Coin can be found under a set of stairs. 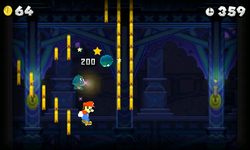 Mario has to navigate through the water under the stairs to reach the Star Coin before Boohemoth blocks it. Upon obtaining the Star at the top of the first area, Mario needs to slide down the right wall to land on a hidden platform. Going right leads to the next area, where a door can be found. 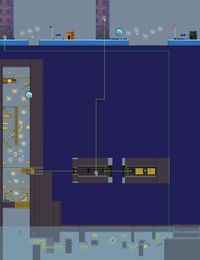 Going beyond the door to the right leads to a hidden area with coins and a Brick Block containing a 1-Up Mushroom. The door leads outside, where Mario falls and lands on the ground. Outside, a Big Boo can be found. Mario then has to climb several spider webs to get past a large pit to the other side, avoiding Boos, where the flagpole can then be found. This exit unlocks World Flower -B. This page was last edited on April 13, 2019, at 08:56.